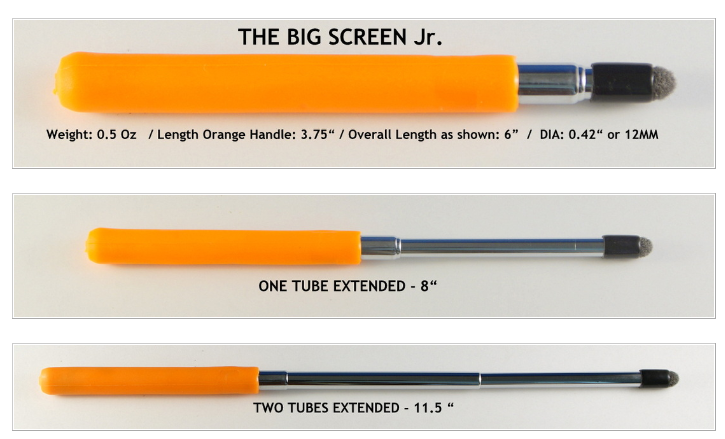 Here is a bit more about Ciara’s recommended stylus, the Big Screen Jr.
A telescoping stylus, very light weight with a nice handle. Sells for $39.99 on Stylus R Us (SRU) website. They feature many more styluses on their website. Thanks to Ciara for sharing! This entry was posted in Accessibility, iPad, iPhone, iPod, iPod/iPad Accessory, Stylus and tagged Accessibility, iPad, iPad accessories, iPhone, iPod, Stylus. Bookmark the permalink.